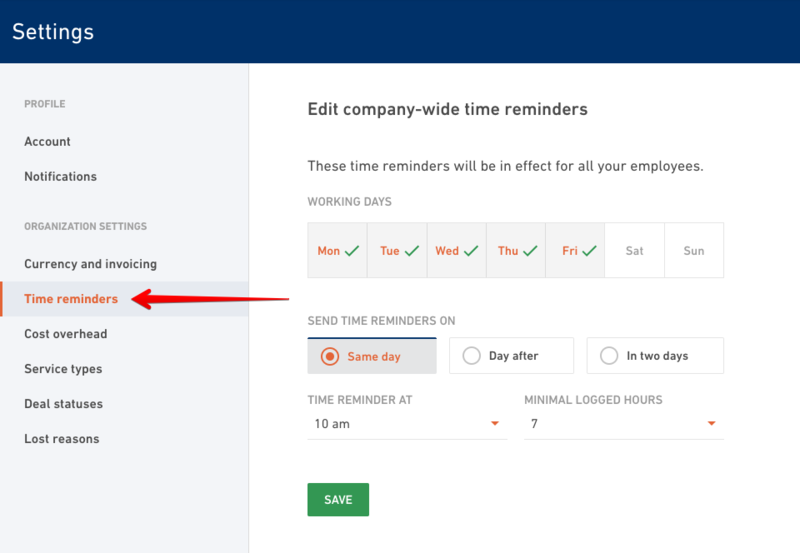 Turn on time reminders for your company and decide when they get sent company wide. You can also define default company working days here. Tracking time in your organization is very important. You won't know if your projects are profitable if you do not track your time. This is why you have daily reminders to make sure everybody tracks their time every day. and select Time reminders. These settings affect everybody in your organization. Define your working days in a week. You don't want to set reminders for tracking time if nobody was working that day. If you want people to track their time immediately after their work day is over, set reminders to be sent the same day. For example, if you're working until 5pm, you could set up a reminder for 5.30pm and everybody should track their time for that day. You can set reminders to come a day after or two days after. For example, people will get a reminder on Wednesday that they need to track their time for Tuesday. Minimal logged hours is a threshold for sending a reminder. If you say that the minimal logged hours are 7, then everybody who logged less than that will still get a reminder.